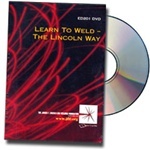 The James F. Lincoln Arc Welding Foundation’s collection of arc welding tutorial DVDs are designed to not only teach students how to weld, but to promote the field of arc welding through accessible, visually engaging videos. The collection of DVDs cover the gamut of welding education — from the basics of welding terminology and shielded metal arc welding techniques, to industry trends and the role welding plays in our daily lives. The DVDs provide tutorials that are applicable for students and educators, as well as professional welders who seek to advance their skills and industry knowledge. Please browse our collection of affordably priced arc welding tutorial DVDs below to learn more.